We don’t even have a trailer for Ridley Scott‘s The Martian yet, but a promo video has already surfaced. 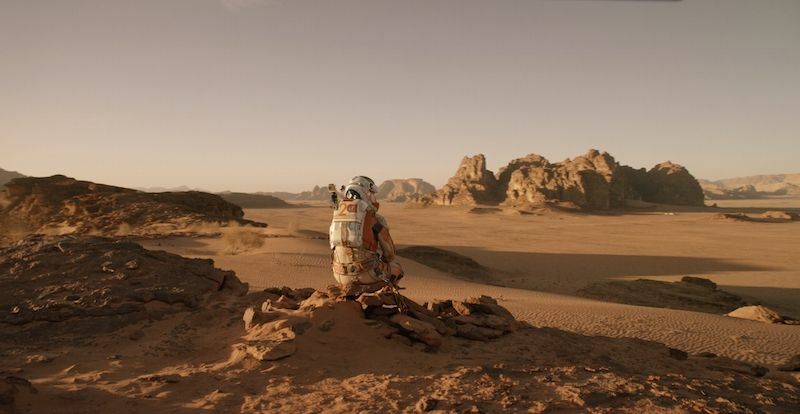 The movie is based on Andy Weir‘s 2012 novel and features Matt Damon as astronaut Mark Watney. He’s part of a manned mission to Mars, but when a storm rolls in, Mark is deemed dead and his crew leaves him behind. However, Mark survives and now he’s stuck on the alien planet alone with no way of contacting them or NASA. A new YouTube channel called ARES: live just posted its first video introducing us to the crew of the Ares 3 which includes Damon as Watney, the ship’s botanist, Michael Pena as pilot Rick Martinez, Jessica Chastain as Commander Melissa Lewis, Sebastian Stan as Dr. Chris Beck, the flight surgeon, Aksel Hennie as German astronaut Aleks Vogel, and Kate Mara as computer expert Beth Johanssen. Check it out for yourself below and keep an eye out for fun facts about the characters that pop up throughout the video. The Martian also stars Kristen Wiig, Jeff Daniels, Chiwetel Ejiofor and Donald Glover, and is due in theaters in 3D on November 25th.